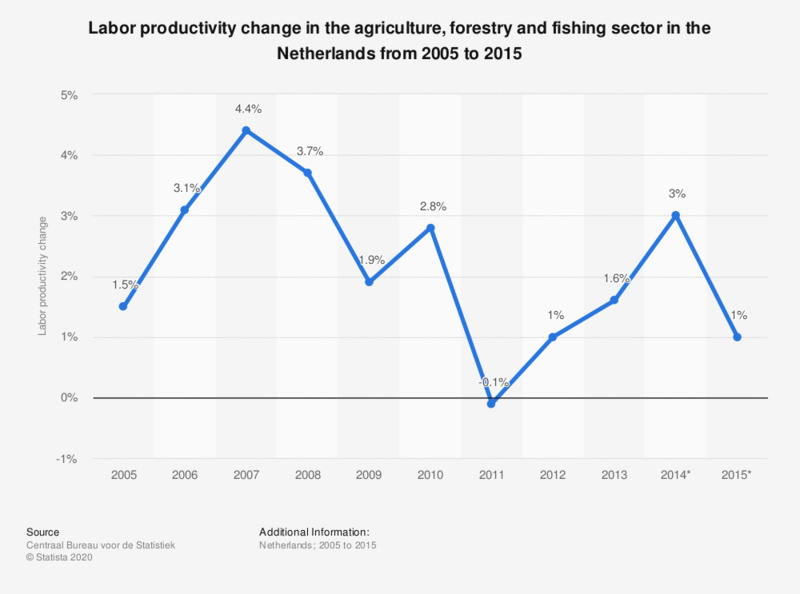 This statistic displays the labor productivity change in the agriculture, forestry and fishing sector in the Netherlands from 2005 to 2015. It shows that between 2005 and 2015 the labor productivity in this sector in the Netherlands consistently increased, with the exception of 2011. The source defines the consolidated production as "the production in a given year minus internal deliveries. The production remaining when a unit (industry, branch, commercial sector) is described as one single company." Labor productivity is "the change of consolidated production or value added per unit of labour volume. Labour volume here is the hours worked." In this statistic the labour productivity is based on the consolidated production per hour worked.